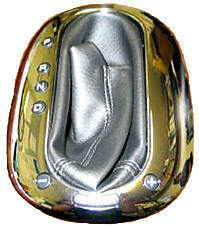 JU-TM481X7AA Plymouth Prowler 97-02 Chrome Shifter Bezel - with Leather boot. Brand new Factory original Prowler shift bezel. These came standard with the 2000-2002's. You can replace the one you have or replace and upgrade the older vinyl style one on your Prowler (1997-1999). Takes five minutes to swap them out. Bright chrome finish brightens up the interior - adds class. Leather shift handle boot included. This chrome bezel can replace the 1997-99 Prowler black plastic cover. Snap fit. 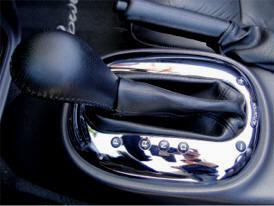 Aftermarket Vinyl shifter boot fits into chrome factory bezel.